Bangkok (AP) – Community leaders from the Christian ethnic Kachin community have called for urgent medical attention for about 2,000 civilians, including pregnant women and the elderly, trapped in the jungle where they fled to escape clashes between the Myanmar’s army and the Kachin guerrillas in the country’s north. 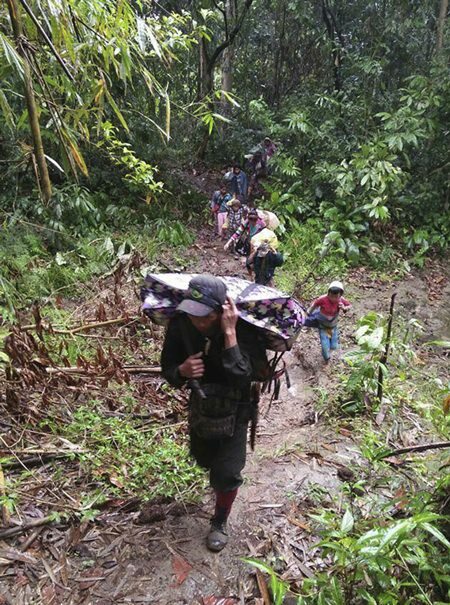 The latest fighting in Kachin state’s Tanai region – an area known for amber and gold mining – began in early April with government shelling and airstrikes in response to threats by the rebel Kachin Independence Army to retake lost territory. The Rev. Mung Dan, a Baptist community leader, said Wednesday the civilians trapped without medicine or sufficient food include five pregnant women, two women who just gave birth, 93 old people, and other villagers wounded by mortar shelling. They are “in dire need of medical treatment as well as rations,” he said by phone. “Even today, it’s been raining the whole day in our region and these civilians do not have any shelter yet and they are suffering from sickness as well,” he added. A non-governmental organization based in Kachin state has sent an open letter to the Kachin State Minister on Wednesday, asking for the permission to rescue civilians but the permission has not been granted yet. Rights and aids groups said the Myanmar government and the military have dramatically increased restrictions on humanitarian assistance to some 100,000 displaced people. The government has virtually denied all access for the United Nations and other international humanitarian groups. Some civilians have already been killed by the government’s offensive, the Kachin say. “At least three civilians were killed by the army’s mortar shells and airstrikes in three different places since April 11,” said Naw Bu, the head of the information department of the Kachin Independence Organization, the political organization to which the Kachin Independence Army is affiliated. The Kachin Independence Army, like other ethnic minority armed groups, has been fighting on and off for decades against the central government for greater autonomy. Combat between the Kachin rebels and the government military resumed in 2011, ending a 17-year ceasefire agreement. The clashes have left hundreds dead and more than 100,000 civilians displaced. Myanmar’s military has long been accused of grave human rights violations against ethnic minority groups in different parts of the country. Most recently, it has been accused of abuses against the Muslim ethnic Rohingya minority in the western state of Rakhine that critics say amounts to “ethnic cleansing,” as violent counter-insurgency sweeps by the army helped drive about 700,000 Rohingya across the border to neighboring Bangladesh, where they stay in refugee camps.